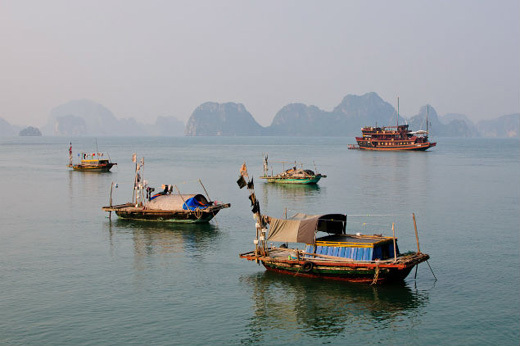 This is one of the moves by local authorities to strengthen the protection of fishery resources and improve the management, protection and promotion of the World Natural Heritage Ha Long Bay. Halong City People's Committee (Quang Ninh province) has announced that as of October 1, all organizations and individuals will not be allowed to perform fishing activities in any form at the venue for visitors. tourism, caves, beaches, waterways, tourist routes and areas authorized by the authority to plan conservation of ecosystems in Ha Long Bay. After October 1, if organizations or individuals fail to comply, they shall be strictly treated according to regulations, including the application of the measure of confiscation and destruction of means, fishing gears and tools used for catching fish in the above areas. At present, in Ha Long Bay (Hoa Cuong area, Tu Du island, Van Boi island, Ngoc Tay island and some areas bordering Cat Ba island district in Hai Phong), some people using motorboats without registratiion boards, following cruise ships for sale of sea products and fruits...The above behavior has caused loss of beauty and traffic safety. Inland waterway, security and order on the bay. Therefore, the Ha Long City People's Committee has issued the document directing Halong Bay Management Board and the inter-sectoral inspection team on the bay to strengthen patrol, control and strictly solve the individuals using small canoes following the cruise ships to sell goods or services. These agencies need to intensify the inspection and supervision of the operation of ships operating on Ha Long Bay, ensuring the right routes and spots already announced and permitted by competent authorities, timely detect and coordinate with functional agencies in strictly handling cruise ships and crew members who let the vendors follow the ships and sell to tourists, set up plans security, order and safety of inland waterway navigation in the bay, with focus on routes 1 and 2, promptly detect and prevent acts of violating regulations on security, order and safety of inland waterway traffic.